These Zombie Arm Lawn Stakes seem to rise up out of the ground as if to say, help! Do not be fooled, because helping haul a zombie out of the ground will only earn you an attack from the walking dead that you helped set free. Of course, you could get lucky and wind up just pulling the arms out of the ground, leaving the ghoul armless and buried. This pair of arms is a simple yet clever decoration that looks great when placed on top of a grave. Each set includes left and right hands, both colored a sickly pale skin tone, like that of a zombie that was only recently reanimated. Both arms are also covered by simple purple sleeves that are tattered and torn around the edges. Each zombie arm features plastic hands attached to a yard stake, which measures a total length of 14 inches. Each set includes two arms, although the tombstone pictured is not included. 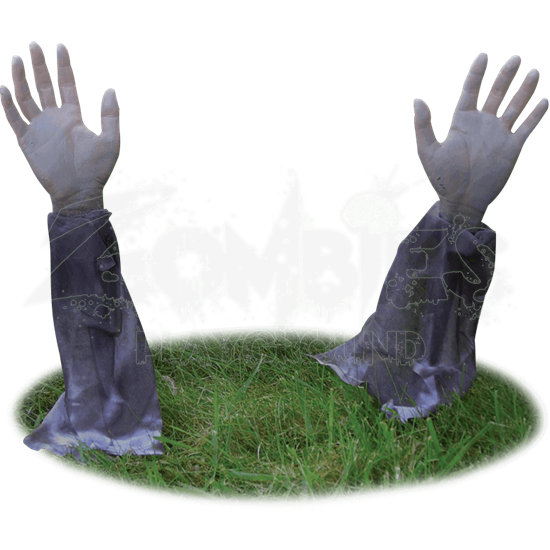 Use the Zombie Arm Lawn Stakes to convert your yard into ground zero of the next impending zombie outbreak.